Sometimes a person who gets drunk can perform functions their friends might regard as ordinary, like carrying on a conversation or driving a car - but the drunkard might have no memory of those things and those periods of amnesia, commonly known as "blackouts", can last from a few minutes to several hours. 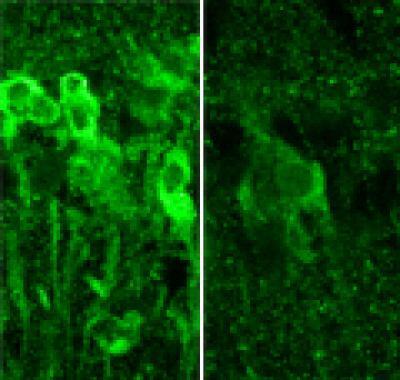 Researchers writing in the Journal of Neuroscience say they have identified the brain cells involved in blackouts and the molecular mechanism that appears to underlie them. Exposure to large amounts of alcohol does not necessarily kill brain cells as once was thought, they say, and instead alcohol interferes with key receptors in the brain, which in turn manufacture steroids that inhibit long-term potentiation (LTP), a process that strengthens the connections between neurons and is crucial to learning and memory. Various receptors involved in the cascade interfere with synaptic plasticity in the brain's hippocampus, which is known to be important in cognitive function. Just as plastic bends and can be molded into different shapes, synaptic plasticity is a term scientists use to describe the changeable properties of synapses, the sites where nerve cells connect and communicate. LTP is the synaptic mechanism that underlies memory formation. The brain cells affected by alcohol are found in the hippocampus and other brain structures involved in advanced cognitive functions. The researchers studied slices of the hippocampus from the rat brain. When they treated hippocampal cells with moderate amounts of alcohol, LTP was unaffected, but exposing the cells to large amounts of alcohol inhibited the memory formation mechanism. "The mechanism involves NMDA receptors that transmit glutamate, which carries signals between neurons," says Yukitoshi Izumi, MD, PhD, research professor of psychiatry at Washington University School of Medicine in St. Louis. "An NMDA receptor is like a double-edged sword because too much activity and too little can be toxic. We've found that exposure to alcohol inhibits some receptors and later activates others, causing neurons to manufacture steroids that inhibit LTP and memory formation." "It takes a lot of alcohol to block LTP and memory," says senior investigator Charles F. Zorumski, MD, the Samuel B. Guze Professor and head of the Department of Psychiatry. "But the mechanism isn't straightforward. The alcohol triggers these receptors to behave in seemingly contradictory ways, and that's what actually blocks the neural signals that create memories. It also may explain why individuals who get highly intoxicated don't remember what they did the night before." "The exposure to alcohol blocks some NMDA receptors and activates others, which then trigger the neuron to manufacture these steroids," Zorumski says. The scientists point out that alcohol isn't causing blackouts by killing neurons. Instead, the steroids interfere with synaptic plasticity to impair LTP and memory formation. "Alcohol isn't damaging the cells in any way that we can detect," Zorumski says. "As a matter of fact, even at the high levels we used here, we don't see any changes in how the brain cells communicate. You still process information. You're not anesthetized. You haven't passed out. But you're not forming new memories." The researchers found that if they could block the manufacture of steroids by neurons, they also could preserve LTP in the rat hippocampus. And they did that with drugs called 5-alpha-reductase inhibitors. These include finasteride and dutasteride, which are commonly prescribed to reduce a man's enlarged prostate gland. In the brain, however, those substances seem to preserve memory. "We would expect there may be some differences in the effects of alcohol on patients taking these drugs," Izumi says. "Perhaps men taking the drugs would be less likely to experience intoxication blackouts."